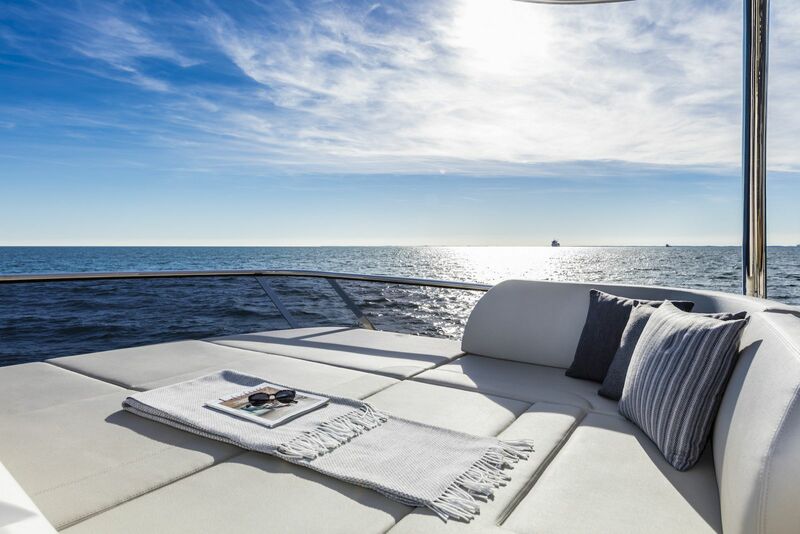 Launched in Cannes this year, the Absolute Yachts 58 Flybridge is as unique as it is family-friendly. 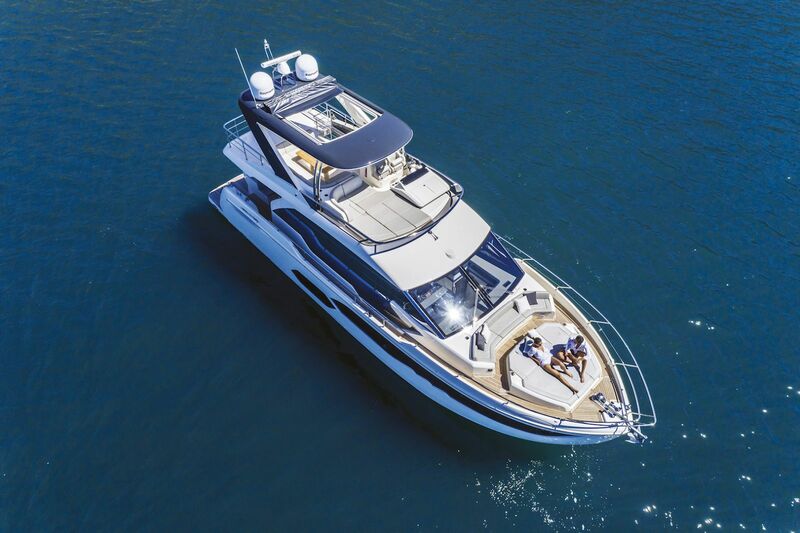 A perfect boating option for the family that likes to cruise together, the Absolute 58 Flybridge has a three-stateroom, three-head layout and plenty of luxurious amenities not often seen on a yacht of this size. 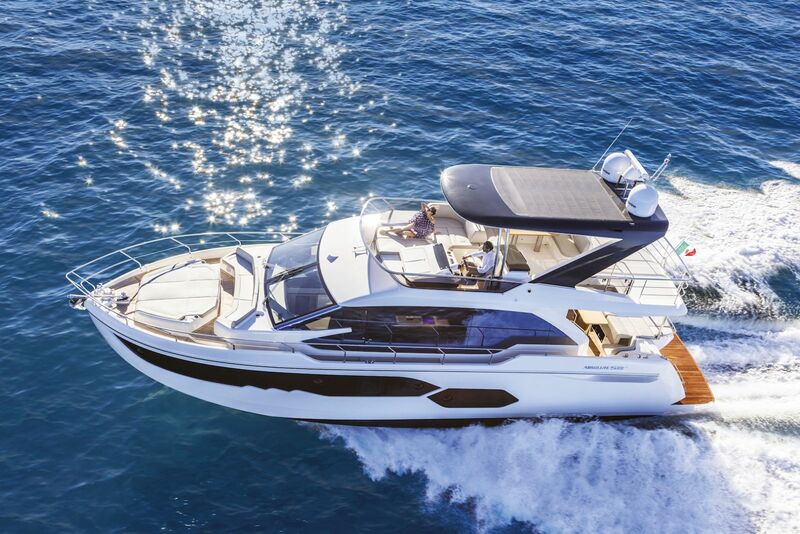 With nearly 360-degree visibility, side-deck access from the helm - via a weather tight door - and joystick driving capability, the 58 Fly makes close-quarter maneuvering and shorthand cruising a breeze. Get behind the wheel and it feels natural, smart and new; a result of the electronic positioning system. The engine room has plenty of room to move around and the Pod propulsion system is easily accessible through the crew’s quarters. 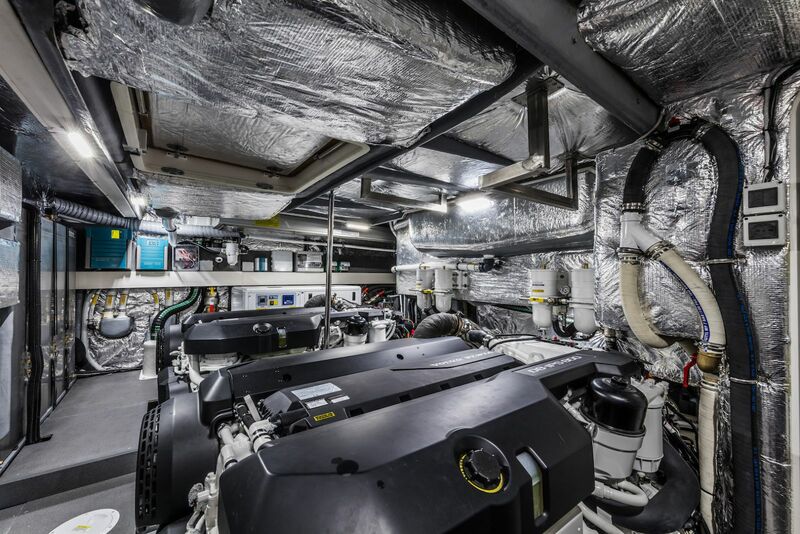 Absolute Yachts 58 Flybridge is a very quiet boat due to a considerate amount of engine room soundproofing - that’s smart insulation with proper flooring and neatly labeled pipework. Stepping up to the cockpit, there’s a second entrance to the engine room accessed through the deck hatch, your cockpit docking station with joystick and bow thruster controls to port. Absolute Yachts’ placement of stainless steel cleats and chocks are located so that there is no chaffing to the boat while docking. Another small, yet appreciated touch. 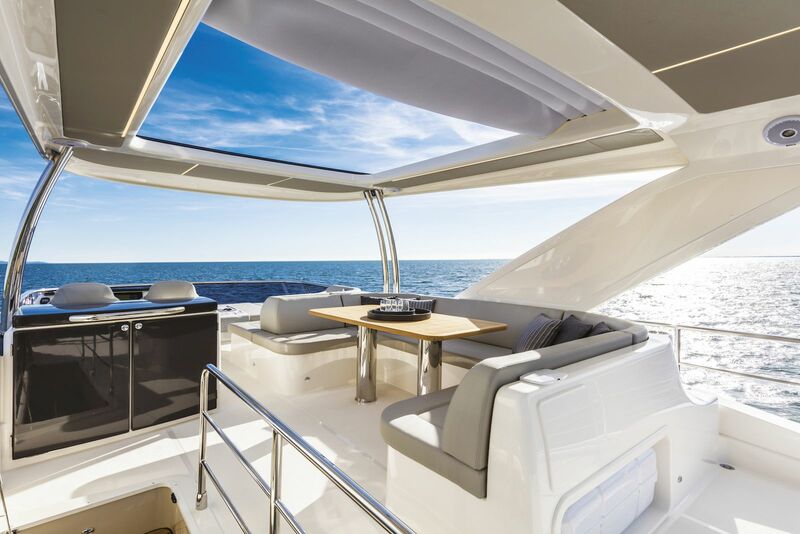 The expanded use of glass on the Absolute 58 Fly gives owners new quartz crystal-shaped hull-side windows plus a second stretch of glass for aesthetics. 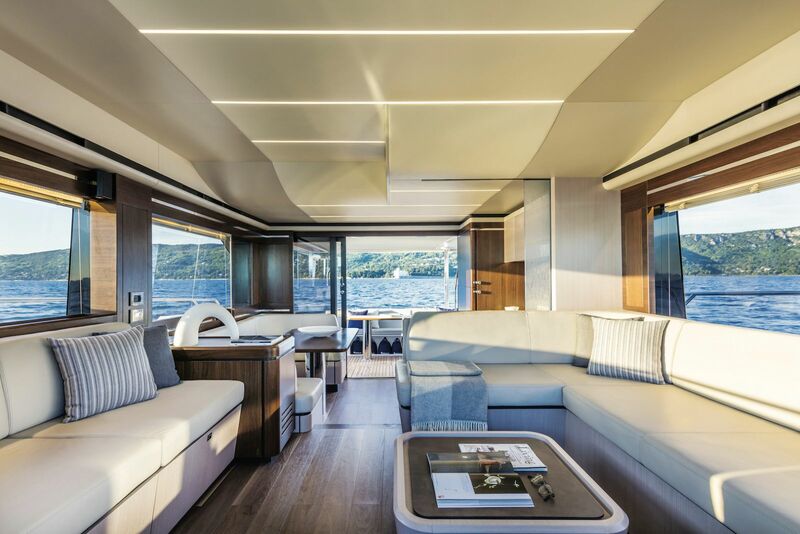 In addition, the glass in the yacht’s superstructure surrounding the salon extends from the side-deck height to the salon headliner. 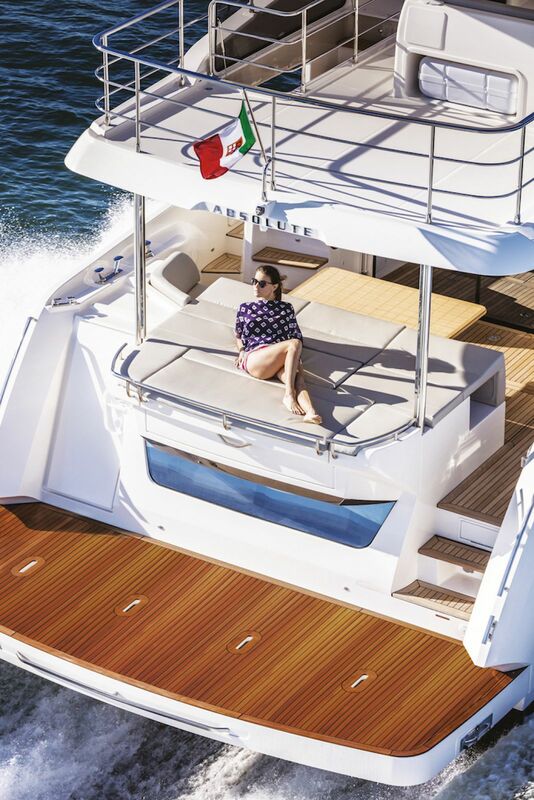 The result is a vessel with an aggressive appearance, a lower profile and a sense of expanded interior volume, as opposed to a yacht that has more fiberglass in her hull and superstructure. 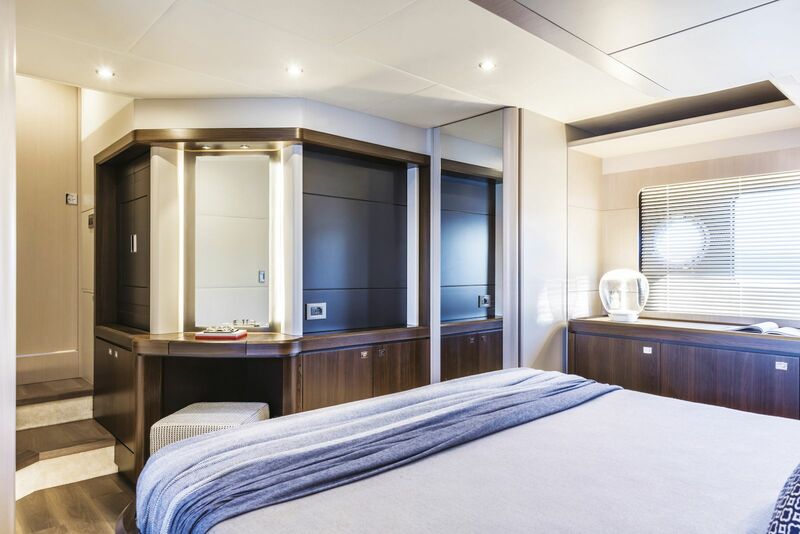 The master stateroom is full-beam with an ensuite head and a large size berth with a washer/dryer. 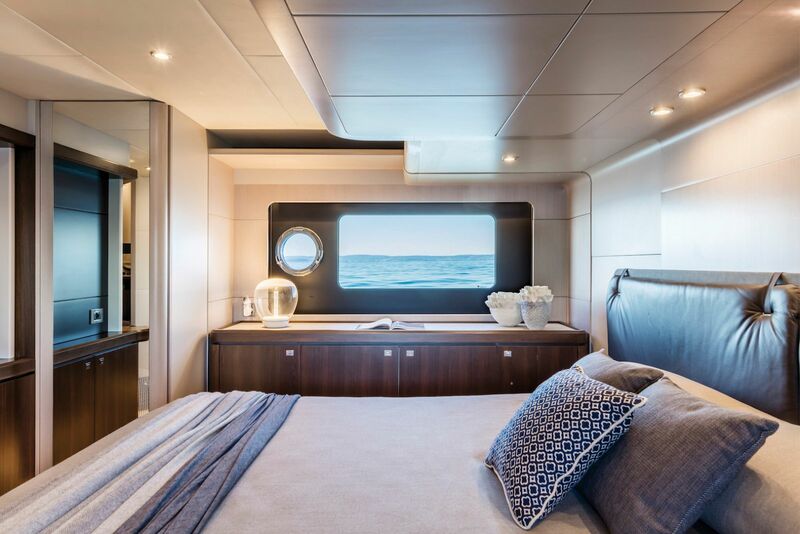 The third stateroom contains side-by-side bunks and also an ensuite head with secondary access to the head via a companionway door. 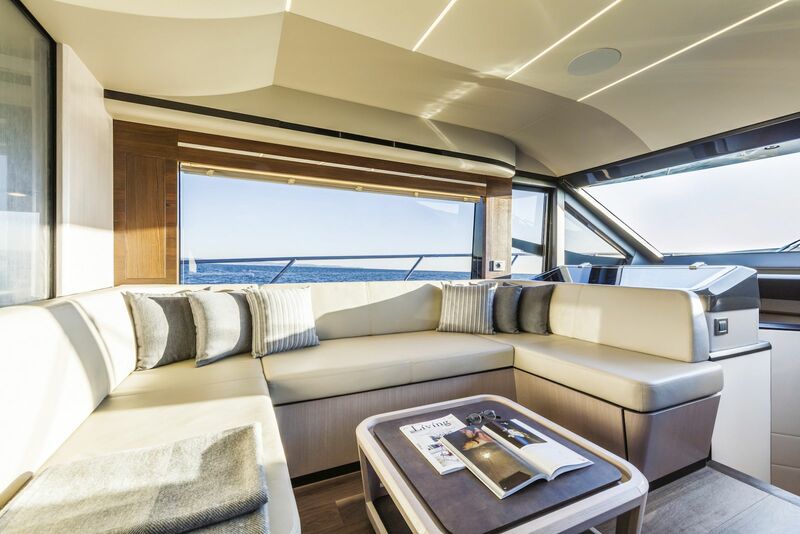 Heading through the companionway the open windscreens draw in large amounts of light, a fantastic touch which continues through to the VIP. 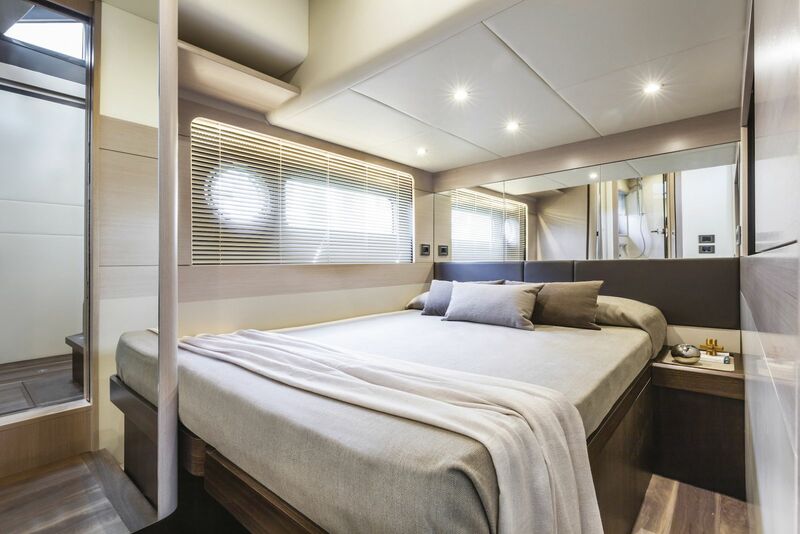 The Absolute 58 Flybridge VIP stateroom has an angled bed which means a true walk-around berth with an excellent wardrobe and drawers on every side of the berth all the way around. So you won't have to lift the bed for storage in this stateroom. The VIP’s ensuite head is enormous with plenty of natural light streaming in from that awesome windscreen. 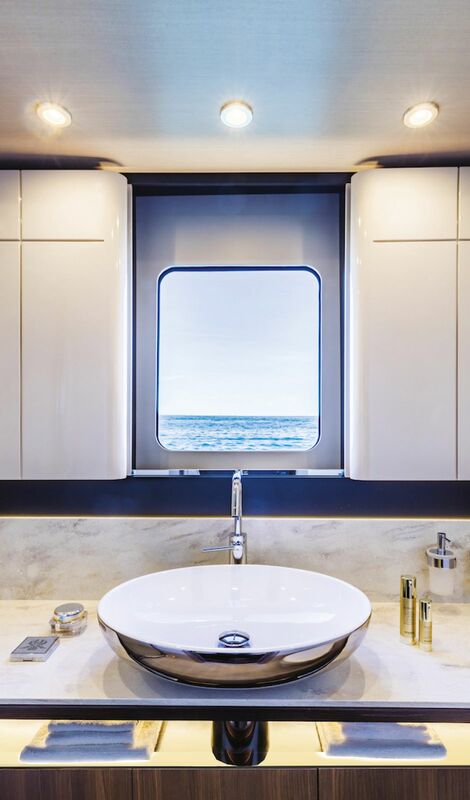 You'll find very luxurious amenities throughout the VIP stateroom with top quality fit and finish and at the touch of a button your window becomes your mirror. 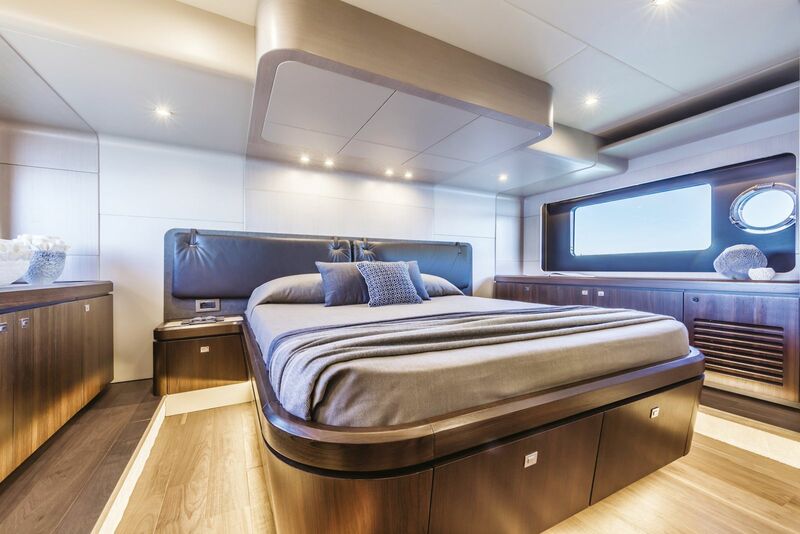 Absolute Yachts use of space and technology is ground breaking...but it doesn't stop in the head. 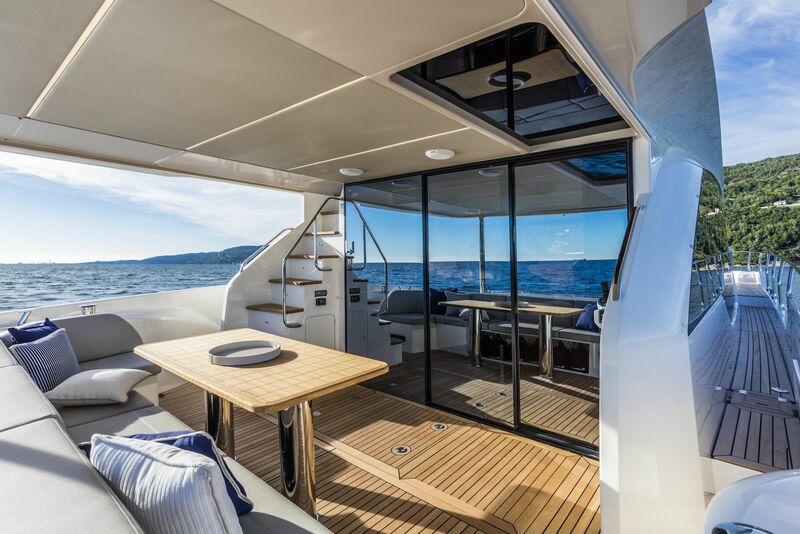 Taking a look at the well-designed cockpit, her larger L-shaped seating allowing for easy access to the port side deck as well as the flybridge steps and secondary engine hatch on deck. Such a well-designed engine space, for instance, the dedicated stowage for deck chairs is very handy. 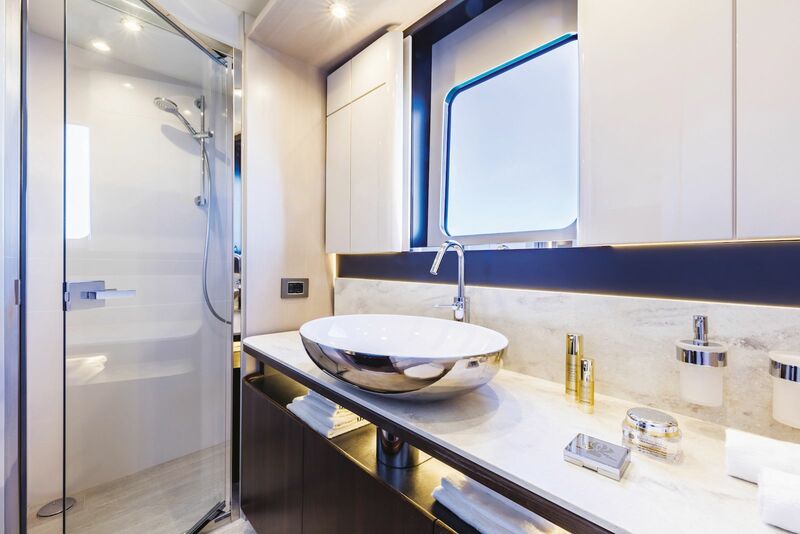 Small conveniences like these listed are an example of Absolute Yachts’ dedication to easy, onboard living. 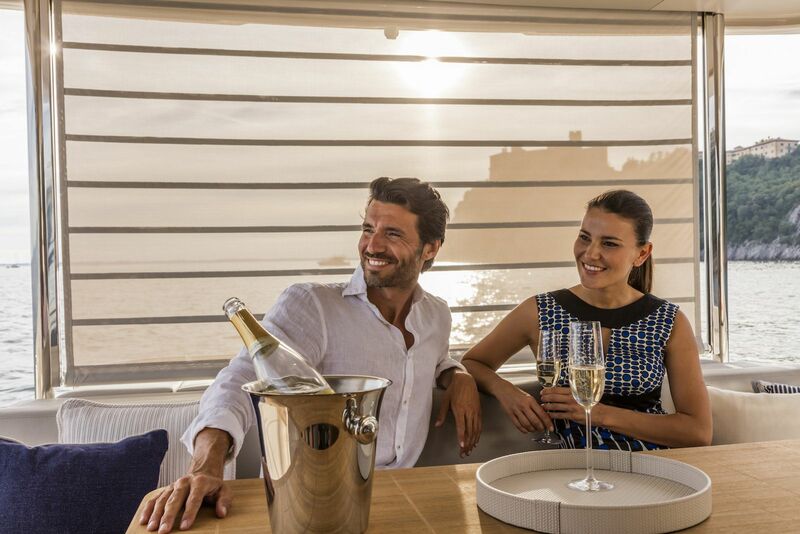 Simple boating means simple docking, which Absolute achieves from both the lower helm and the deckhouse. 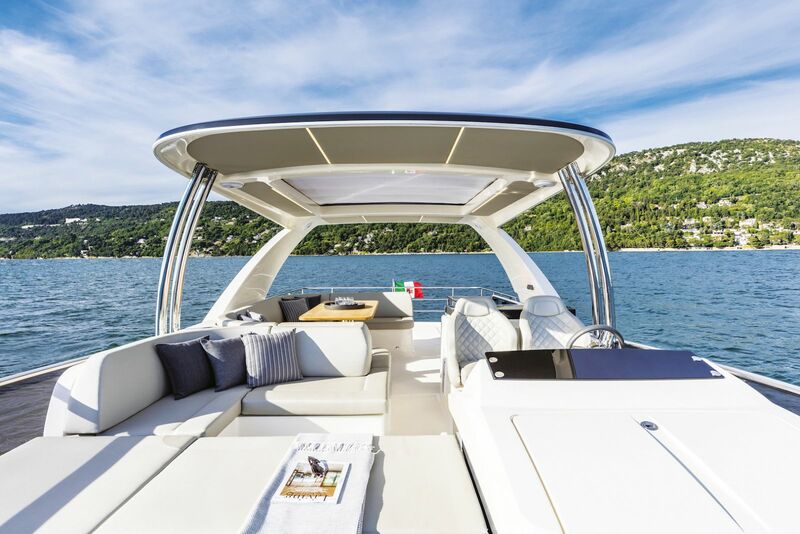 Pulling into the marina on the all new Absolute 58's bridge becomes a pure pleasure, with clear views of the slip as the helm is to port and your controls are precisely placed. 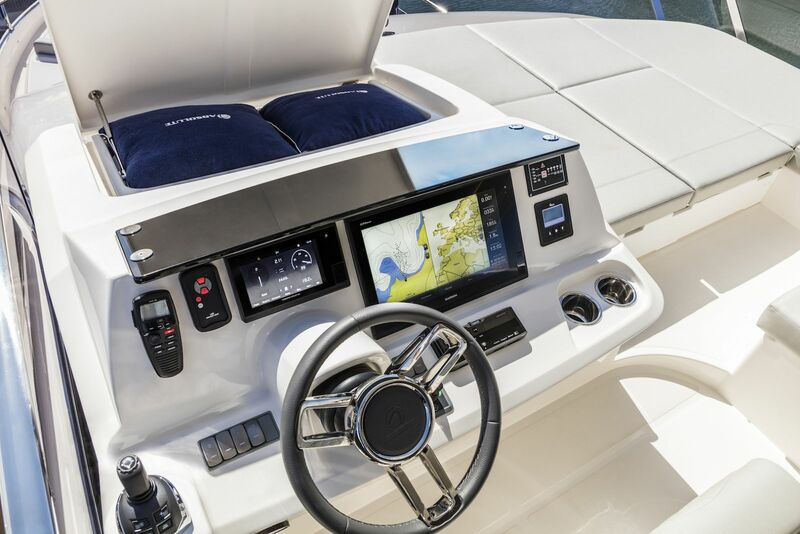 The electronics and displays on the bridge are very well laid out, for instance your 15” touch screen, VHF spotlight, alarm panel, windlass, fusion stereo and displays for the Volvo Penta engines are neatly placed. 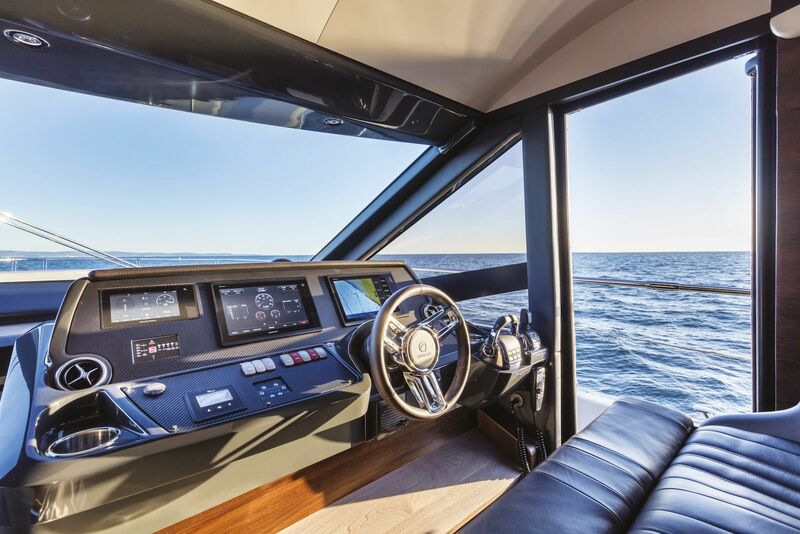 To the left of the tilt-based steering wheel are your bow thruster controls, trim tabs and the IPS joystick, so you can get that ultra-clear view while docking. Running this yacht up top is comfortable, not only for its placement of the joystick but also for the curved backed diamond-stitched seats. 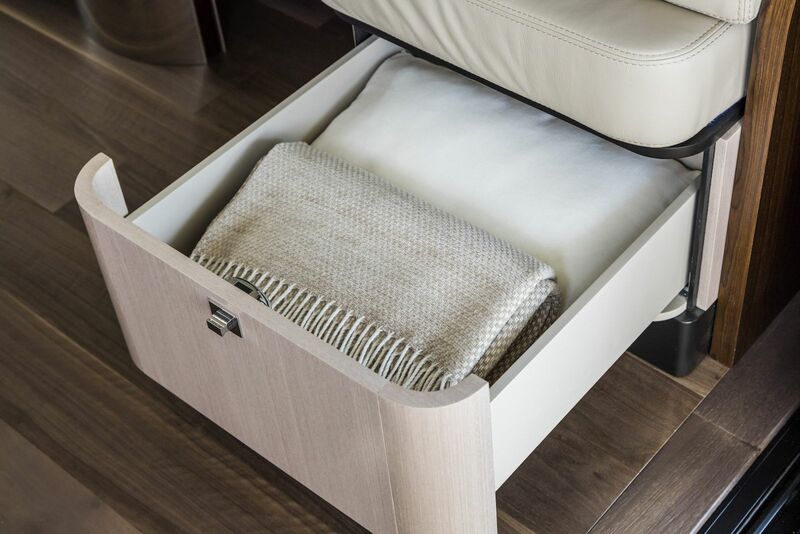 It's a small yet luxurious touch. Down below your lower helm panel is absolutely gorgeous with a sleek carbon fiber panel and soft touch dash. 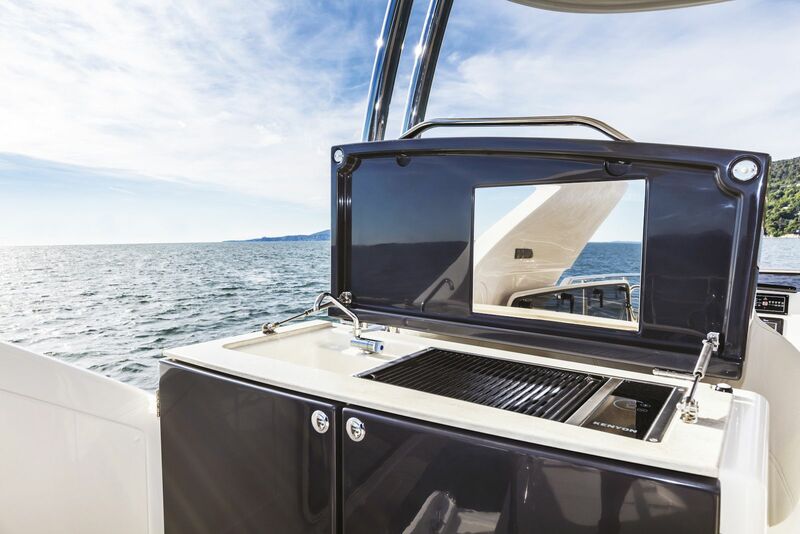 The twin 15” displays are flanked with air conditioning, your USB connectivity, SeaKeeper screen, wipers, windlass are in clear view and to the right hand side, bow thruster and joystick controls. 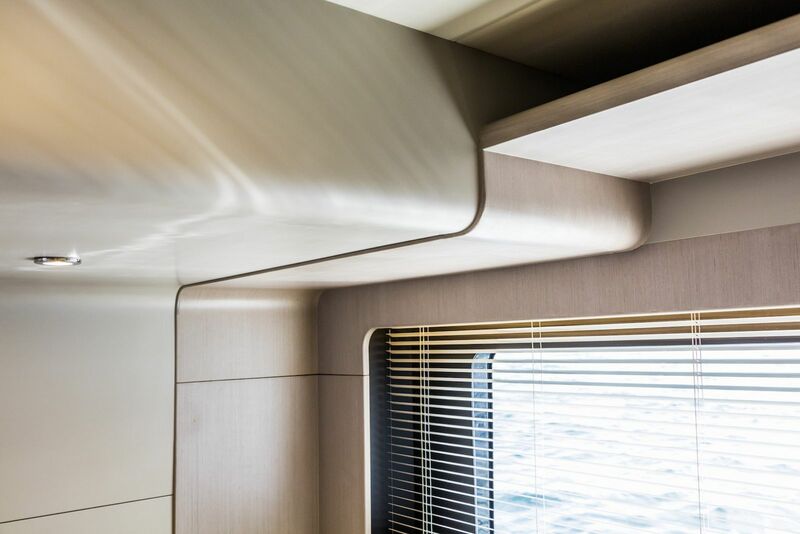 Captains will enjoy the standing visibility and huge forward windows, a weather tight opening side door allows for easy access to the midship cleat and starboard side views. Watch the stern as you back into the slip using one hand on the joystick and your eyes on the destination. The dual seating with foot rest is also very comfortable. Feeling warm? 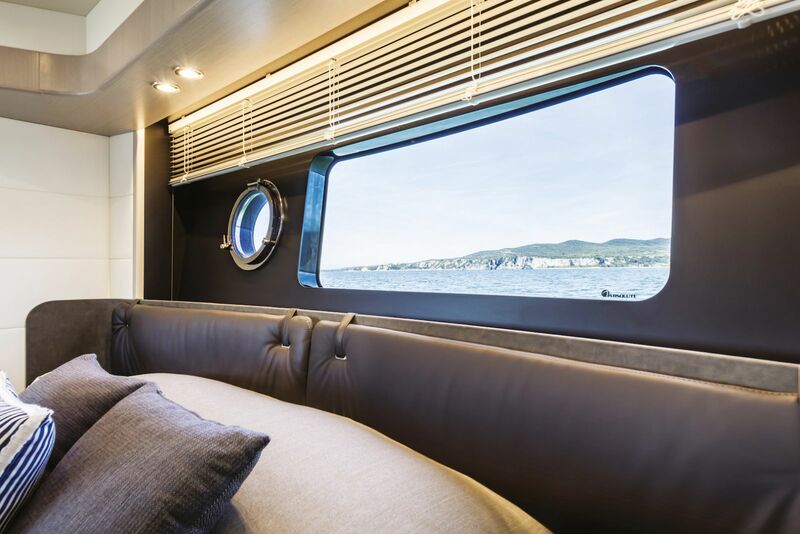 Enjoy a cross-wind relief with dual drop down side windows, to port and sideboard. Need to check your electrical panel? Generally the electric panel is hidden but here Absolute placed this mechanism forward, adjacent to the helm just port. 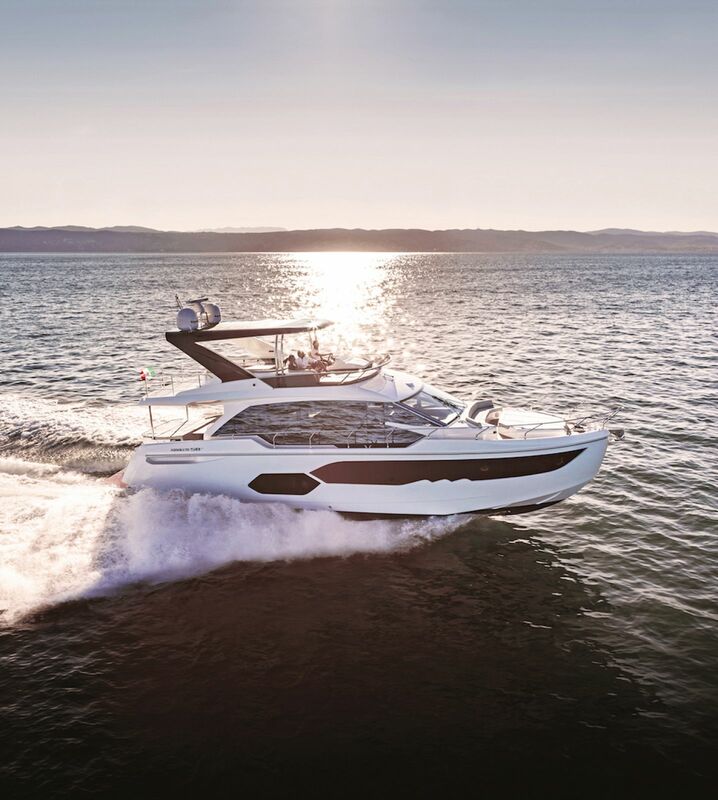 Absolute Yachts’ advanced hull design and the IPS 800 Pod systems ensure low fuel consumption, precise maneuverability, and a quiet ride all of which create an enjoyable seagoing experience. The IPS is dialed in perfectly to the joystick and using only small pulses bring her into dock with exacting precision - this is a handling characteristic the brand is best known for. 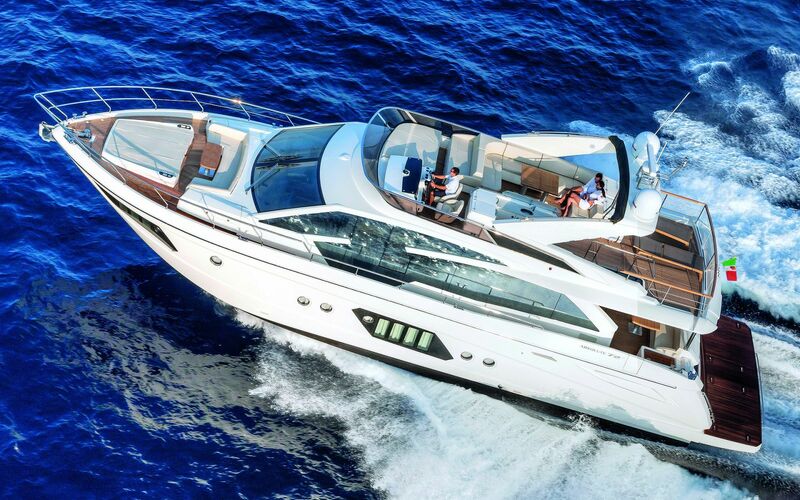 The 58 Fly reaches a top speed of 29.6 knots, but at your best economical cruise speed you’ll burn .05 nautical miles per gallon. 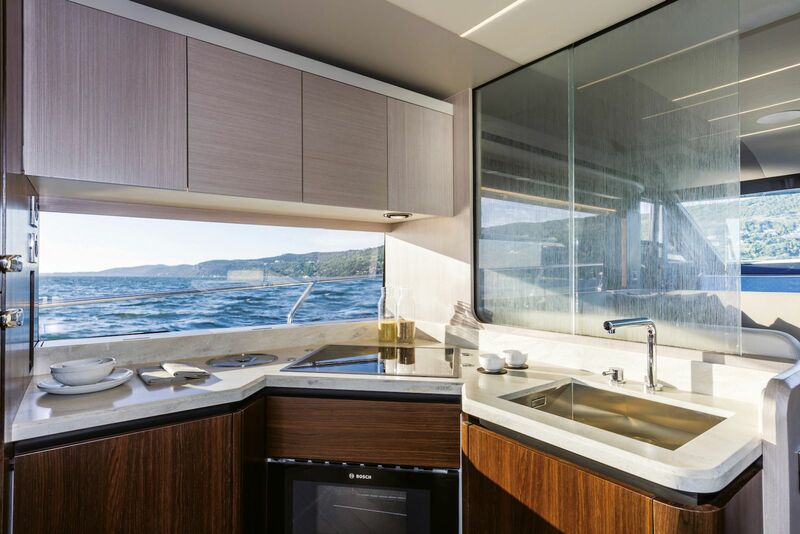 The warm interior is a well thought-out galley with contrasting, rich dark and light oak cabinetry and cream Corian countertops. The walnut sole in the galley and throughout the salon adds a beautiful touch and then there’s the buttery soft ecru leather sofas. 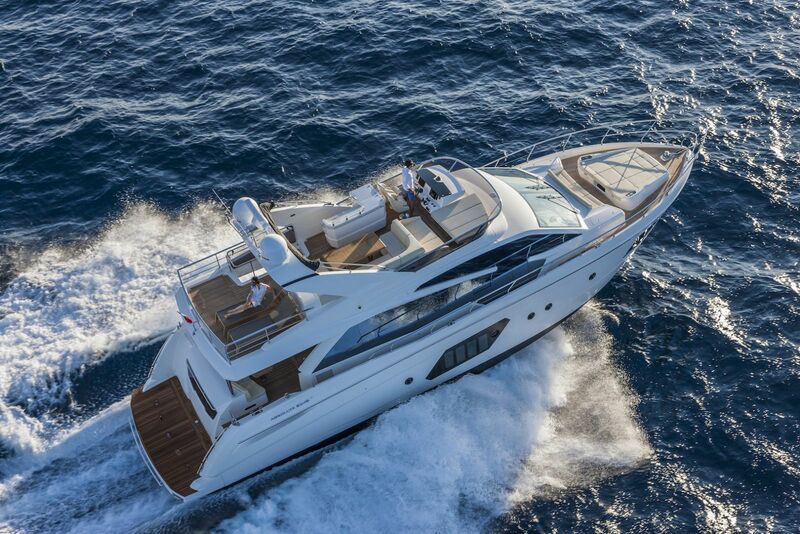 Cruise in comfort and luxurious style in this magnificent flybridge yacht. 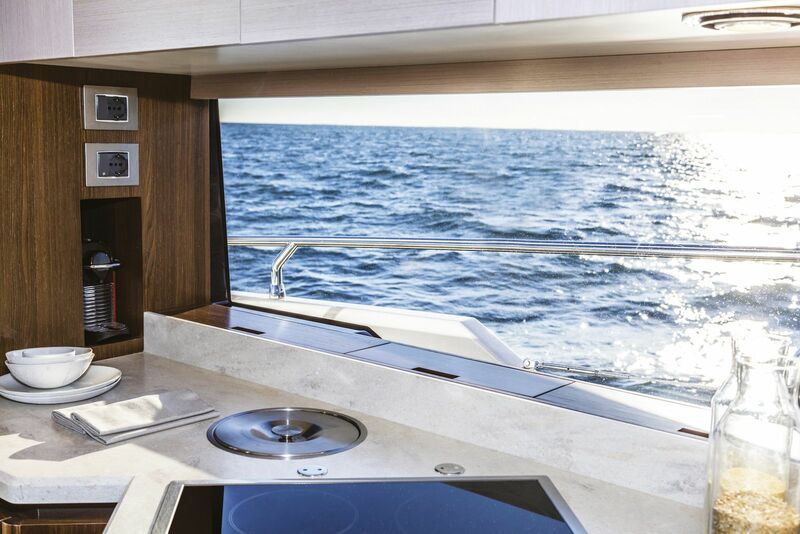 It seems like a simple thing placing an electric cooktop catty-cornered to the yacht’s salon doors, but one of the benefits of this positioning is the extra floor space. The set-up also enhances the feeling of volume, which is apparent in all of Absolute’s designs. 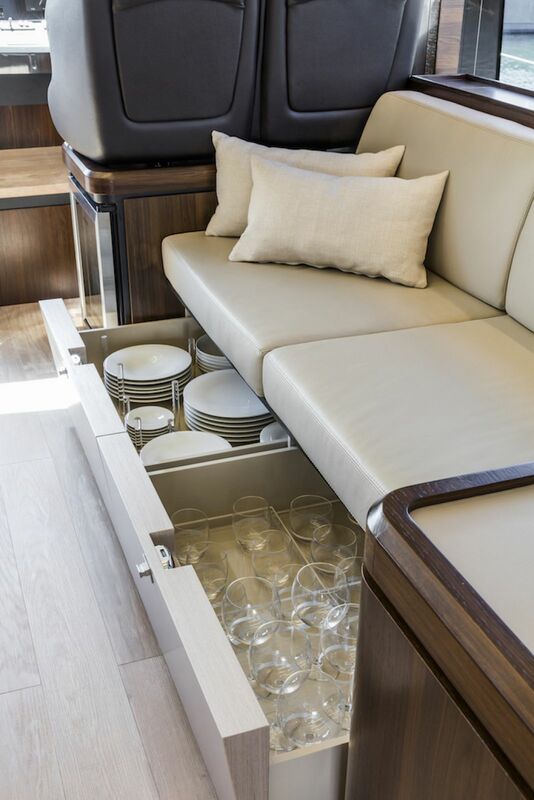 The clever design for its aft galley layout is fully equipped with a domestic size refrigerator, dedicated coffee nook station, and \cutlery, cup and glassware storage. 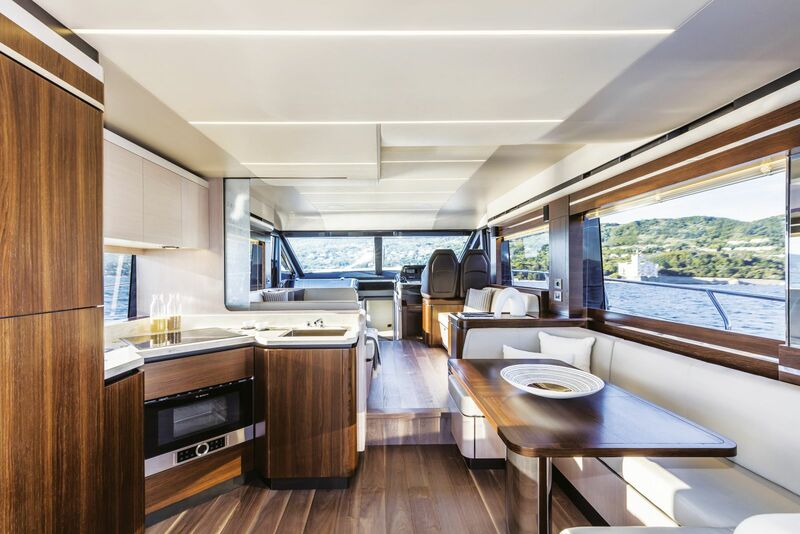 It seems like a simple thing placing an electric cooktop catty-cornered to the yacht’s salon doors, but one of the benefits of this positioning is the extra floor space. The set-up also enhances the feeling of volume, which is apparent in all of Absolute’s designs. 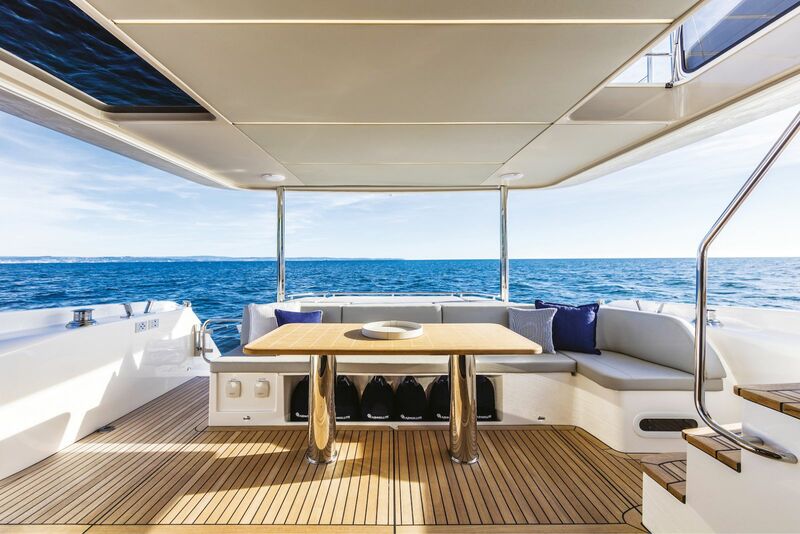 The main internal dining table to starboard slides out for more even more dining guests and slides in for more onboard living space. 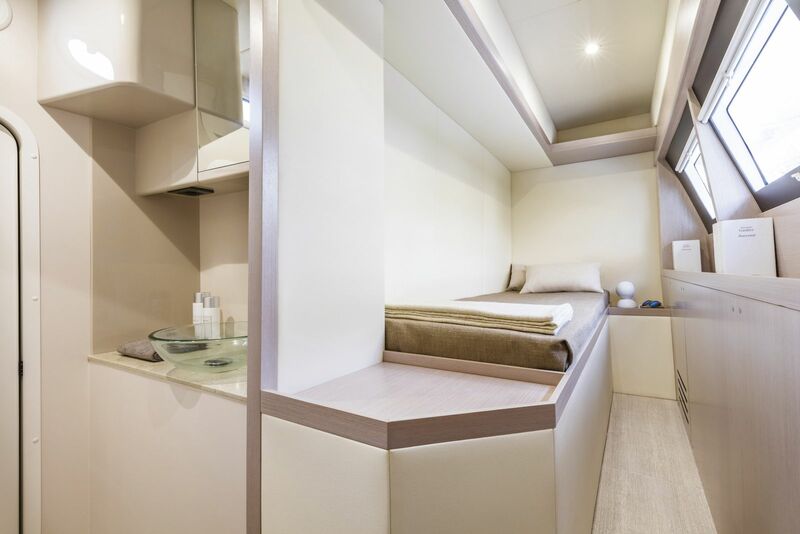 The open plan galley with electric partition - to free yourself from the galley - could easily be described as a chef’s dream. 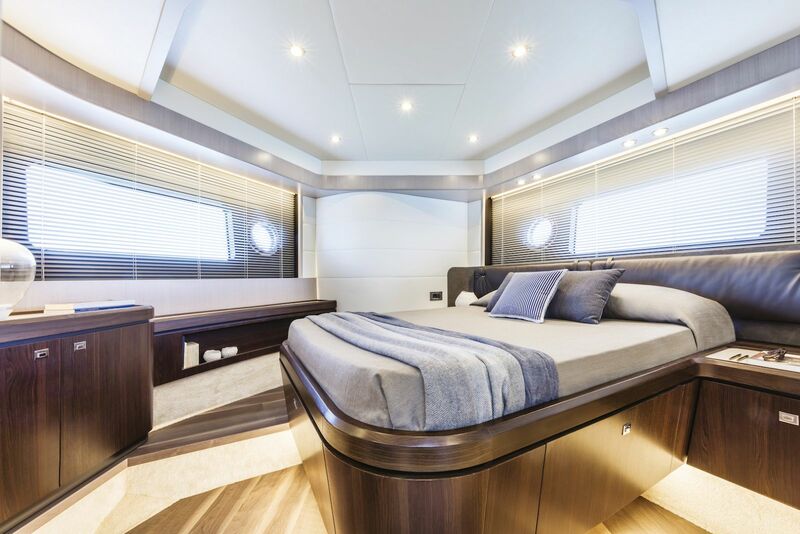 All of these considerations add to the superb functionality of this 58 foot yacht. 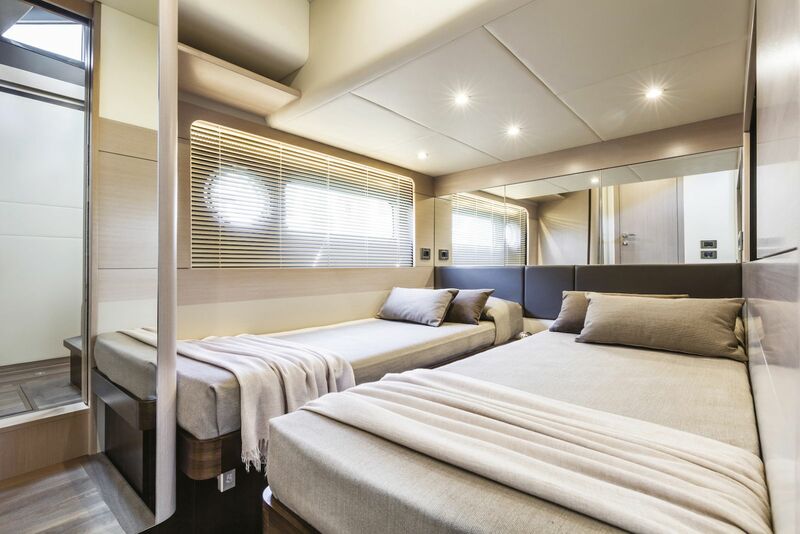 This along with the massive windows and salon sofa with clever storage for all of your cutlery just below the cushions temps you to feel the Absolute line of yachts truly has convenient onboard livability. Shallow steps with thick treads lead you up to her bridge. 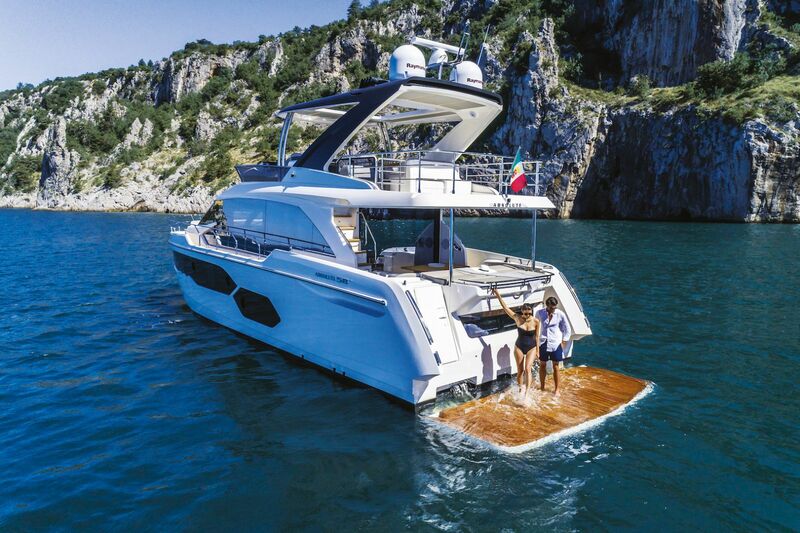 Here you'll enjoy the grill, refrigerator and ice maker, just port of the is the helm in an ergonomically sweet position. Deck space aft is left open, so you can do with what you'd like, some customers opt for sun loungers especially when the desire is a fresh summer glow, other's may position a davit. 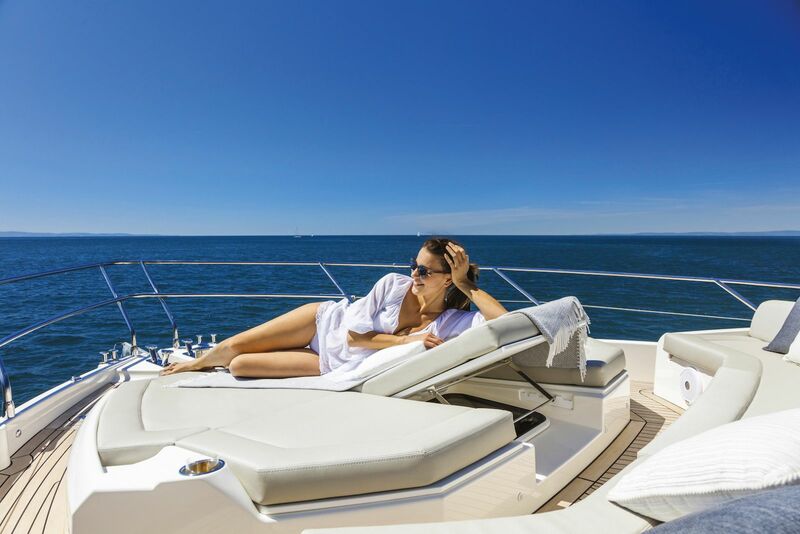 Whatever your desire are, Absolute Yachts and SI Yachts are here to assist you in outfitting your dream yacht. 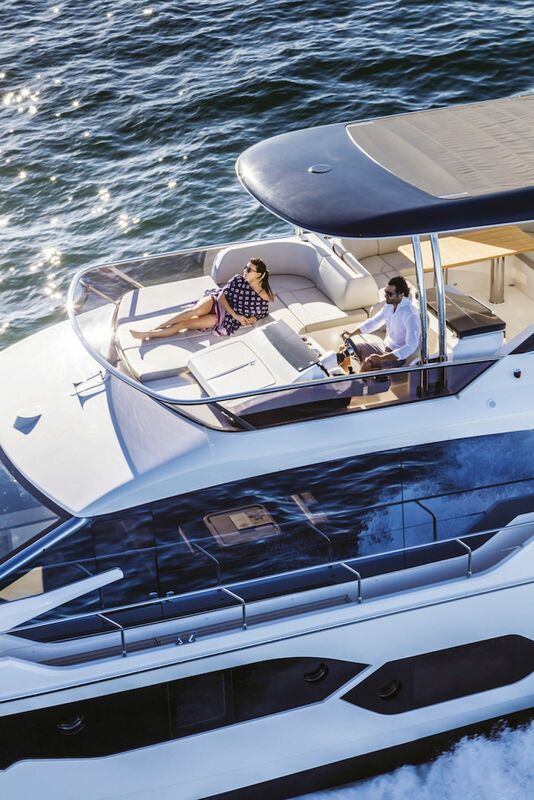 For more information on the new Absolute 58 Flybridge, contact your SI Yachts Sales Professional today. 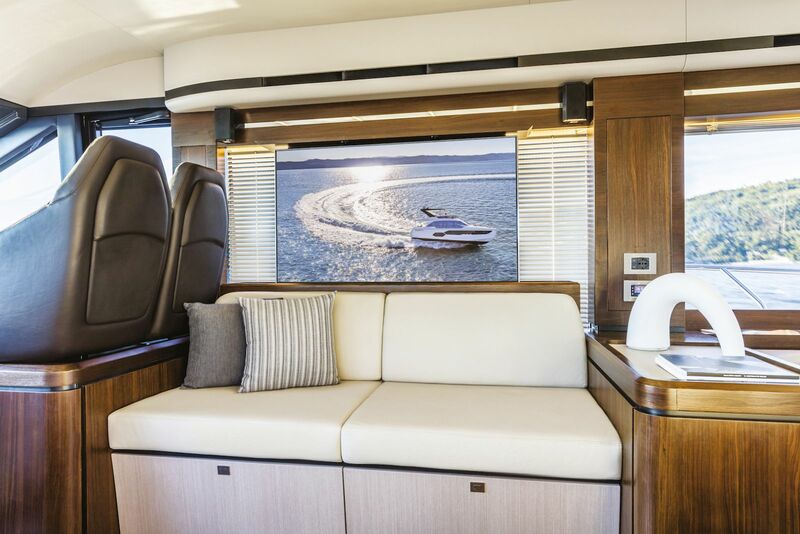 Absolute's new 58 Flybridge is a grand example of how well the builder combines clever use of space with luxury. 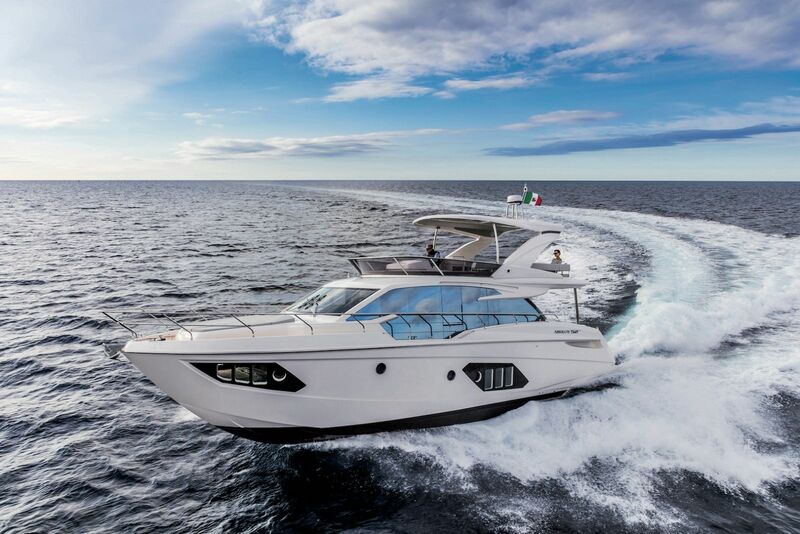 Absolute Yachts released this official video trailer of the new 58 Flybridge.